It's not like the Cinema, it is the Cinema. Sony VPL-HW50es on demonstration at Audio-T Manchester. 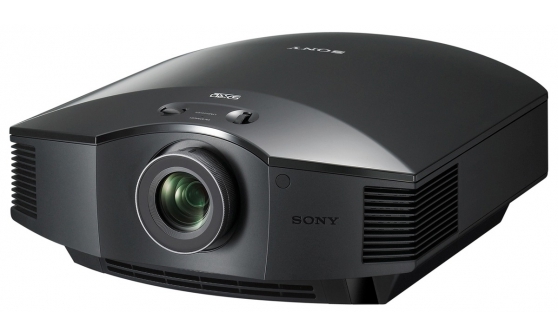 The VPL-HW50ES/B is Sony’s new 3D home cinema projector available in black.It includes the very latest technology and delivers a premium home theatre experience.Packed with new innovative features that draw on Sony’s latest optical engine - the VPL-HW50ES/B utilises Sony’s clever ‘Reality Creation’ to dramatically enhance high definition 1080P content to deliver sharp, crisp Full HD images. When you're viewing your favourite film or even trialing the latest release - you want to know that you are watching the action the way it was meant to be seen. Conventional home cinema projectors typically enhance the green colour to secure the image brightness however the VPL-HW50ES/B combines with a new Bright Cinema and Bright TV Mode to achieve enhanced brightness than the previous model, without losing colour reproduction. Additional features such as improved light efficiency, 1,700lm brightness and with SXRD panels enhance the 3D image even further making for a great viewing experience. The VPL-HW50ES/B also features a number of user-friendly functionality upgrades including a built in 3D synchronous transmitter reducing set-up time and removing the need for extra cabling. With this projector, you can experience award-winning explosive 3D and 2D imagery seamlessly with separate 2D and 3D parameters under a variety of application modes – Dynamic, Standard, Game, Cinema and Photo. And don't forget the Sony 3 year warranty. Specialist telephone support – an exclusive multi-lingual telephone helpline staffed by technical experts with detailed understanding of projector products. Collect-and-deliver repair service – if your problem cannot be resolved via the helpline, we’ll activate our no-hassle collect-and-deliver repair service. All financial costs are covered – parts, labour and logistics to and from our state-of-the-art European repair centres. PrimeSupport will be provided through the Sony accredited partner. Free loan unit – you’ll receive a free loan unit of similar specification if repairs are likely to exceed 10 working days, minimising your disruption.